It’s located 1 mile from Insh Village and 4 miles from Loch Insh, where there’s sailing, canoeing everything for the water sport enthusiast. 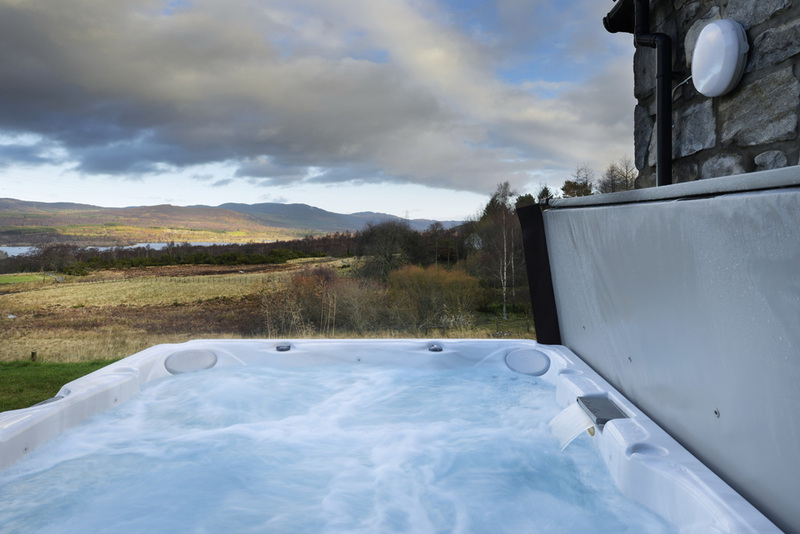 The Grand sprawling ‘Cottage’ has been furnished to a very high standard with fantastic views all round. The lodge can sleep up to 10 but this would really be for families, it can comfortably sleep 6. The lodge is also wheelchair accessible, the shower rooms are also large wet rooms, there is access into the lodge via the utility room with a concrete ramp. The lodge was built with wheelchair access in mind, there is 2 wet rooms and also a chair which can be used in the shower. There is also have a Free Standing Toilet Frame available. Access is via the ramp into the utility room and there is no internal steps. The cooking hob has also been lowered slightly to wheelchair height. Right from the door step you can walk straight into the forest with miles and miles of both walking and biking tracks right across into Glen Feshie. Print it off so you can put guest names against beds. To Book we require a 25% deposit and full balance 6 weeks prior to arrival. There is a charge for pets, please add them when making your booking. Rules for dog owners. 80% refund on cancellation given 30+ days before arrival date. 50% refund on cancellation given 14+ days before arrival date. 0% refund on cancellation given less than 14 days before arrival date. Bookings are placed on provisional and not confirmed until we have received deposit. We also take a bond which is refundable minus the costs of gas and electricity used in your stay if above average use and to cover and damages that may happen. We recommend you take out insurance in the event that you may need to cancel. A perfect retreat ..just perfect! Arriving at Mountain View Lodge was an absolute delight, it was late in the afternoon and the sun was low and warm still. We wound our way slowly up the track to the lodge so as to admire the amazing views over the Monadhliath mountains the scene was made extra special as we passed the most beautiful mountain hare not at all bothered by our arrival! we didn’t startle the deer either that leaped elegantly from the garden of the lodge as we approached, it had been watching us. The lodge has everything and really is as good as it looks.. our daughter is in a wheelchair and finding accommodation that is fully accessible is a real challenge for us but Mountain view is fully accessible with no compromise on luxury. That attention to detail makes all the difference so thank you so much to Mark & Sadie and the housekeepers who keep it so beautiful! Karen, Jeff & Sammy Watt and pooches Skipper the Airedale and Missy the poodle.